Dozens of dogs that arrived in the Bay Area from a South Korean dog meat farm now have a chance at a good life. SAN FRANCISCO (KGO) -- A group of dogs that arrived in the Bay Area on Thursday now have a chance at a good life. They were rescued from a farm in South Korea, where the SPCA says the animals were being raised so they could be killed and sold at food markets. The last 15 of the 57 rescued dogs arrived at the San Francisco SPCA after a long 11-hour flight from Seoul. Their eyes are downcast and most seem terrified and uncertain of where they are. One is afraid to even get out, maybe thinking he's going to the market for slaughter. 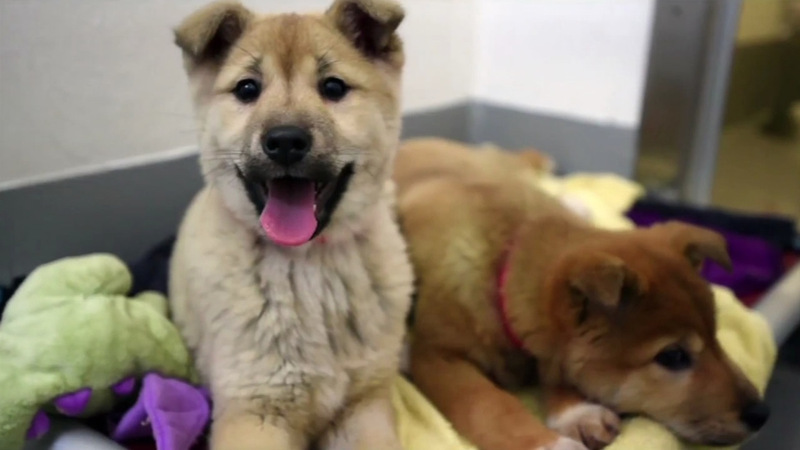 Dozens of dogs and puppies rescued from a dog meat farm in South Korea have arrived at the San Francisco SPCA. Almost all of the puppies are a type of Korean Mastiff, a Tosa mix. "Some of the dogs, as you see, are very friendly. Most of them are completely docile," San Francisco SPCA veterinarian Jennifer Scarlet said. None of the dogs appear to be suffering from major injuries. "We're just seeing sort of nutritional issues and trying to get them over into a better food source but, other than that, they're in pretty good condition," Scarlet said. The dogs were destined for a market where people buy meat and produce. Dog meat is considered to be healthy, especially during the summer. They're killed by electrocution, beaten to death or hanged. "It's really primarily the older population that consumes dog meat. Most of the younger population does not consume the meat and they're not interested in consuming it," Humane Society International's Adam Parascondola said. Parascondola was in charge of the rescue. "The condition on the farm are really deplorable. They never cleaned the cages, the dogs live in darkness, very dark small cages, there's no heating," he said. He says the farmer agreed to shut down his dog farm. "He's going to go into agriculture. I believe he's going to grow chili peppers. That's what he expressed to us." The dogs will be quarantined for about a week then spayed or neutered. Some will be ready for adoption immediatly but others may take longer. Click here to learn more about the rescue.